Chord tone soloing and soloing over changes on guitar is a complex area which can be approached in many ways, and where even a cursory search for online resources is likely to leave you with more questions than answers. 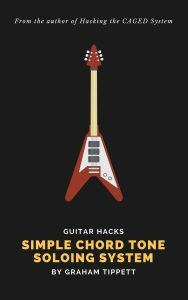 It’s particularly difficult on guitar because guitarists tend to arrive at this point with varying amounts of knowledge and gaps in their playing, whereas other instrumentalists approach soloing over changes in a more uniform way. While it’s true that everyone learns differently, I believe that a solid approach to soloing over changes requires a system that is a) not based on patterns, b) develops the ability to locate notes on the neck either by interval or by the name of the note, and c) develops the player’s ear to the point where he/she is able to fully express themselves and truly improvise on their instrument as oppose to a formulaic, calculated and somewhat cold approach to something that should be, insofar as is possible, spontaneously created in the moment; and this is what I hope to achieve with this eBook. $1.00 to download or free to read on the blog.